The Sochi Olympics have started and I really couldn’t be more excited. For me, everything pretty much stops for the Olympics fortnight and I focus all of my time and energy on watching the games. I cry at every medal ceremony, I fill our DVR with coverage, I refrain from the news to avoid spoilers, I wikipedia the official rules for curling – it’s really an obsession. Ten years ago, for the opening ceremonies of the Athens games, my extended family had the brilliant plan of having a party to celebrate the opening ceremonies wherein we ate the host country’s cuisine (or at least our interpretation of it). From that, a tradition was born and last night we celebrated our sixth opening ceremonies party. Admittedly, when Russia was announced as the host country a few years ago, we were a little concerned about the meal because really, Greece, Italy, and China all have seriously good cuisine, but all we could think of for Russia was borscht, potatoes, and vodka. However, tradition is tradition, so we planned a Russian meal and were pleasantly surprised that the meal was one of the best yet. I’ll be sharing several Russian dishes over the next two weeks, but I feel like you need a really awesome Russian dessert to start things off. 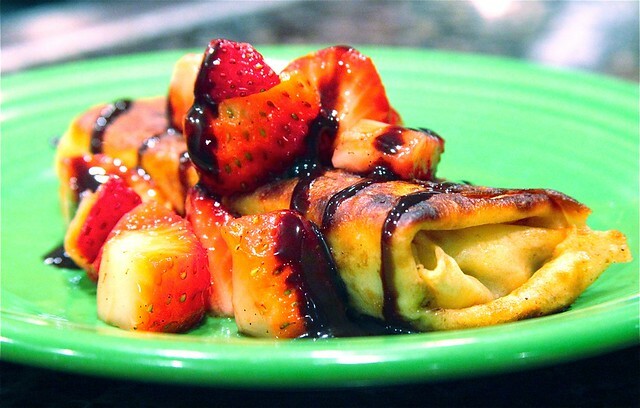 The blintz has 3 parts – the crepes, the filling, and the topping. You start by making the blintz, then you fill them, roll them up like burritos, and fry them. For a topping I just cut up some strawberries and added a little sugar and vanilla and drizzled chocolate syrup, but I you could use any sweet fruit (berries, pears, apples). Give them a try – you’ll feel so authentic watching ski jumping while eating blintzes. 1. To make the blintz, whisk the eggs, flour, sugar, and salt until smooth with no lumps. Stir in the milk to make a thin batter. Heat a small frying pan (8″) over medium heat. spread a bit of butter into the pan (I just use the stick and run it around the pan once in a circle. Pour about 1/4 cup of batter in the pan and swirl it around to coat the bottom. Allow the blintz to cook until the one side is done, then carefully flip to finish the other side. It should be solid, but not brown. It may take you a few trials to adjust your pan to the right heat and get the hang of frying and that’s OK – the batter will make a few more blintzes than you’ll need. Set the finished blintzes on a plate to cool. 2. Stir the ricotta cheese, cream cheese, and sugar. The filling can be a little lumpy. Stir in the sugar, egg yolk, vanilla, and lemon to complete the filling. To assemble, spoon a few tablespoons of batter onto one side of the blintz in a line. Fold in the ends and roll like a burrito. 3. Once all blintzes have been assembled, butter a frying pan and brown the blintzes on both sides over medium heat until golden brown. Serve warm topped with fruit, chocolate sauce, or both. I can’t believe I didn’t eat one, especially after frying them. Every time I veered near them I was caught up in the tractor-beam of the stroganoff, blinis, runsas and borscht. What a feast!